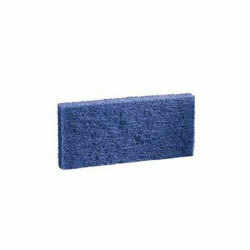 3M 8242 Doodlebug Blue 4.5" x 10" cleansing pad designed for medium-duty cleaning and scrubbing jobs. Use with No.6473 Doodlebug Hand Block or No.6472 Doodlebug Pad Holder. 3M Blue Scrub Pads for Doodlebug Cleaning System.